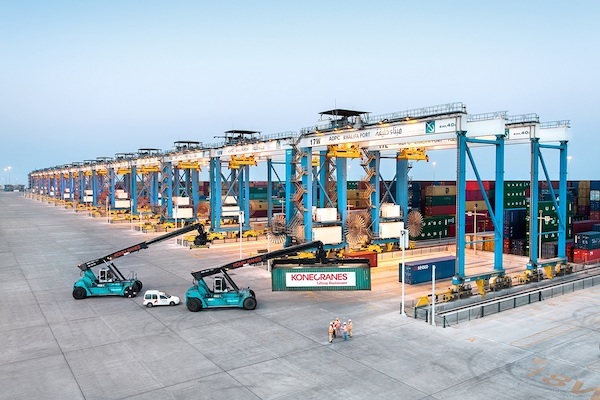 In UAE, to build its container terminal in Khalifa Port named the Khalifa Port Container Terminal (KPCT), the port company Abu Dhabi Terminals (ADT) has chosen Konecranes to supply 54 Automated Rail Mounted Gantry cranes. The Finnish manufacturer has been already selected by ADT to deliver 52 ARMG cranes for the first phase of the KPCT in 2012. The machines have a lifting capacity of 40t and can stack one over six containers high. “Thirty of the cranes will be nine-wide, and twenty-four will be eleven wide,” added Konecranes company. The new order will be booked in the fourth quarter 2018.